Brushed aluminum pole with ring. For residential use; has 13 different mounting positions. Entire kit is 100% made in USA. 2.5?x4? Sleeved US Flag with 5 ft. oak wood Pole, with 2-position nylon bracket. 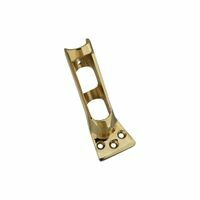 National Hardware Flag Pole Bracket, Decorative, Series: V1907, Suitable For Use With: Flat Poles Upto 1 in Diameter, 6-1/4 in Length, 2 in Width, 2.4 in Height, Horizontal, Vertical Mounting, Solid Brass, Brass Used to support flat poles up to 1" in diameter. Mounts on vertical and horizontal surfaces. Decorative design. Visual-pack.